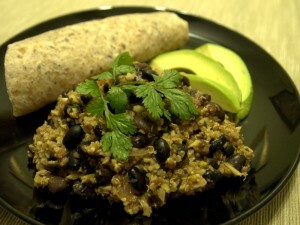 This spin on classic rice and beans uses food-processor processed cauliflower and quinoa as a substitute for rice. Not only does it taste great, but it packs a whole ton of nutrients and protein! Pulse the cauliflower in a food processor until it is in uniform small rice-like pieces then set aside. Heat the olive oil in a large pot over medium heat and saute the onion, garlic, cumin, and pepper flakes. When the onion is transparent, add the cauliflower and quinoa and continue to saute, stirring occasionally, until the cauliflower is tender, about two or three minutes. Add the beans, tomatoes, vinegar, and vegetable broth and cover the pot. Bring the ingredients to a simmer then uncover. Stir in the cilantro and serve with an avocado and the salsa of your choice.